ABSTRACT. Prior to 2007, efforts to monitor and conserve hawksbill turtles (Eretmochelys imbricata) in the eastern Pacific Ocean were opportunistic and records were virtually non-existent. The first abundance estimates were published in 2010, but contained limited data on the species. Ongoing research since that time has led to the identification of several rookeries, including sites containing large proportions of the overall hawksbill nesting currently known to occur in the region. Monitoring projects were established at several sites and have since provided substantial nesting data on the species. Here we summarize data collected between 1983 and March 2016 from all sites (n = 9) confirmed to host >10 nests in any given season to provide an update on hawksbill nesting in the eastern Pacific. We documented a total of 3,508 hawksbill nests, 265,024 hatchlings and 528 individual nesting females in the region. The vast majority of these records (99.4%, 99.9% and 99.6%, respectively) were generated subsequent to 2007, coinciding with the discovery of eight of the nine rookeries included in this study and the organization of monitoring efforts at those sites, which led to the increased documentation conferred here. Our findings should not be misconstrued as increases in actual nesting or signs of recovery, which could diminish the ongoing need for conservation actions, but rather as optimism, that there is still an opportunity to restore the species in the eastern Pacific. The top three sites in terms of average annual number of nests were Estero Padre Ramos (Nicaragua; 213.2 ± 47.6 nests), Bahia de Jiquilisco (El Salvador; 168.5 ± 46.7 nests) and Aserradores (Nicaragua; 100.0 ± 24.0 nests), and all three sites are located in mangrove estuaries in Central America, highlighting the importance of these rookeries/habitats for the survival and recovery of hawksbills in the region. The remaining six sites received between 6.9 ± 7.3 nests (Costa Careyes, Mexico) and 59.3 ± 17.7 nests (Los Cobanos, El Salvador) annually. By integrating data collected on nesting hawksbills with local conservation realities at the most important known hawksbill rookeries in the eastern Pacific, we provide a more holistic view of the conservation status and management needs of the species in this ocean region. Keywords: population status, reproductive biology, demography, critically endangered, marine conservation, mangrove estuary. The hawksbill turtle (Eretmochelys imbricata) has historically been the focus of intense human exploitation, and in some cases remains heavily exploited, leading to global population declines of >80% and its inclusion as Critically Endangered (CR) on the Red List of the International Union for the Conservation of Nature (IUCN) (Mortimer & Donnelly, 2008). Despite the blanket classification of this and other marine turtle species on the IUCN Red List, such an approach fails to capture the regional differences in population status that often arise from impacts that vary spatially (Seminoff & Shanker, 2008). The importance of evaluating the differential marine turtle statuses and levels of ongoing threats at sub-global spatial scales has been recognized by the IUCN (IUCN, 2003), and this has led to regional assessments of both leatherback (Dermochelys coriacea) and loggerhead (Caretta caretta) turtles, with area-specific evaluations of other species within the taxon slated to follow (Wallace et al., 2013; Casale & Tucker, 2015). Less than a decade ago the hawksbill turtle was considered extremely rare in the eastern Pacific Ocean and no consistent nesting was thought to occur at that time (Mortimer & Donnelly, 2008). Notwithstanding this perspective, the discovery of important remnant nesting and foraging strongholds beginning in 2007 (Vásquez & Liles, 2008; Gaos & Urteaga, 2010; Liles et al., 2011; Gaos & Yañez, 2012) led to a regional data sharing workshop in 2008, where data were compiled and subsequently published, providing the first comprehensive analysis of hawksbill nesting (as well as in-water sightings, strandings and bycatch records) observations in the region (Gaos et al., 2010). Catalyzed by the early findings, the sudden revelations surrounding hawksbills in the eastern Pacific prompted increased attention by the international conservation community and the formation of various, and in most cases, multi-organizational actions aimed at learning about and recovering the species. These escalated efforts led to ongoing discoveries of hawksbill nesting and foraging grounds throughout the region (Alfaro-Shiqueto et al., 2010; Gaos & Urteaga, 2010; Quiñones et al., 2011; Brittain et al., 2012; Carrión-Cortez et al., 2013; Chacón-Chaverri et al., 2014; Tobón-López & Amorocho, 2014; Heidemeyer et al., 2014; Kelez et al., 2016). The rapid surge in data has quickly improved researchers' understanding of the species and their critical habitats, behooving updated regional assessments. This is particularly true for nesting as evaluating the size and dynamics of wildlife populations is a core underpinning of conservation ecology (Galliard et al., 1998) and monitoring the number of females that come ashore to nest is the most logistically and economically feasible method to evaluate sea turtle populations (Balazs & Chaloupka, 2004). Recent studies on nesting beaches have demonstrated differences in habitat selection (i.e., mangrove estuaries vs open-coast beaches) and local conservation realities (e.g., protection vs extraction) among sites, with implications for conservation and recovery of the species (Liles et al., 2015a, 2015b, 2016). Furthermore, whereas hawksbills in the eastern Pacific were previously referred to as a single population (Gaos et al., 2010, 2012a, 2012b; Liles et al., 2011, 2015a, 2015b; Wallace et al., 2011), recent genetic research has revealed the existence of multiple stocks in the region, as well as a unique reproductive ecotype represented by hawksbills nesting in mangrove estuaries (Gaos et al., 2016). These findings have heightened interest in understanding differences in nesting levels and conservation scenarios at the various rookeries. In this study we collected data from nine rookeries in the eastern Pacific, ranging from Mexico to Ecuador. We use our findings to 1) present an updated assessment of hawksbill nesting activity in the eastern Pacific region, 2) discuss nesting biology of the species, and 3) describe the conservation realities and challenges at the nesting sites. These data provide a baseline with which to compare future nesting abundance and site-specific population trends. This study encompasses all hawksbill rookeries (n = 9) confirmed to host >10 nests during any given season along the eastern Pacific Rim (Fig. 1). The nesting sites are distributed across five countries, including Mexico (MX; n = 1; classified as the North America region), El Salvador (ES; n = 3), Nicaragua (NI; n = 2) and Costa Rica (CR; n = 1) (collectively classified as the Central America region), and Ecuador (EC; n = 2; classified as the South America region). We classified individual nesting beaches according to whether coastlines were interrupted by natural barriers (e.g., rivers, rock outcrops) and/or were given distinct local nomenclature, and we grouped beaches together into individual sites as recognized by local inhabitants (Liles, 2015). All sites were classified as either mangrove estuaries (located within a mangrove, salt-water forest estuary) or open-coast (facing the open ocean). nests year-1 along the Pacific coast of North (A), Central (B) and South (C) America. Beach surveys to encounter nesting hawksbills and their nests consisted of a combination of nocturnal and/or early morning beach patrols. When hawksbills were encountered (and when feasible), we measured curved carapace length (CCL: nuchal notch to posterior-most tip of marginal scutes), applied Inconel flipper tags (National Band & Tag, Newport, KY, USA) to both front or rear flippers, as well as an internal passive integrated transponder (PIT) tag to a single front flippers to allow for ongoing identification, and recorded the date of the emergence event. Tagged turtles observed across years were classified as remigrants, with remigration intervals representing the number of years between successive nesting events. Internesting intervals were calculated by the number of days between successive nests by an individual turtle within a season. We documented all successful nesting events (whether the turtle was observed or not) by encountering nests during or posterior (i.e., within 12 h) to oviposition, then calculated the fate of all nests as either protected (in situ, relocated along the beach, or relocated to a hatchery by personnel) or lost (poached, predated, washed away by tides). Nests initially left in situ or relocated along the beach were marked and tracked throughout the incubation period, and were reclassified as 'lost' if poached, predated or washed away at a later date. Nest protection rates were calculated by dividing the number of nests protected by the total number of nests recorded for each season. Clutch frequency (i.e., the number of clutches laid per season) was calculated by recording the total number of nests for known (i.e., observed/tagged) individual turtles. When feasible, we conducted post-hatching nest excavations to quantify hatchlings and calculate a hatching success rate, which we determined by dividing the total number of live hatchlings (emerged and/or found in nest during excavation) by the total number of eggs deposited in a nest. Eggs relocated to hatcheries or along beaches were counted at the time of relocation, while the total number of eggs for nests left in situ was determined by only counting shells consisting of 50% or more. For sites implementing the use of hatcheries, live hatchlings emerging from nests or encountered during excavations were released to the sea under the cover of darkness (Eckert et al., 1999). Because nesting in South America begins toward the latter end of the calendar year and extends into the following year, for tables and figures we classified data for nesting seasons at these sites corresponding to the year during which the season started. All data were tabulated, analyzed and graphed using Microsoft Excel v.14.16.2. Mean values, standard deviations (SD) and ranges are reported throughout the present paper. There were differences in the years monitored, monitoring effort, quantity and spatial extent of individual nesting beaches/sites, habitat type, and other parameters at the study sites (Table 1). A combined total of 3,508 hawksbill nests were recorded in the eastern Pacific during the study timeframe (Table 1), with virtually all nests (99.4%) recorded since 2008 (Fig. 2a) and the majority occurring at Bahia de Jiquilisco (ES; 38.4%) and Estero Padre Ramos (NI; 36.5%) (Fig. 2b). An average annual total of 689.5 ± 71.0 nests were deposited across the region, with Estero Padre Ramos (NI) receiving the greatest average annual number of nests (213.2 ± 47.6), followed by Bahia de Jiquilisco (168.5 ± 47.6), Aserradores (NI; 100.0 ± 24.0), Los Cobanos (ES; 59.3 ± 17.7), Osa Peninsula (CR; 52.0, only one year of data available), El Pelado (EC; 46.0, only one year of data available), Punta Amapala (ES; 23.3 ± 10.8), Machalilla (EC; 20.4 ± 10.0) and Costa Careyes (MX; 6.9 ± 7.3) (Table 1). hatchlings produced, and total number of reproductively active females observed/tagged. 2016). Dash indicates no data available. Of the 3,508 nests documented across all sites, 3,048 (86.9%) were protected and 460 (13.1%) were lost, with an average annual protection rate across all sites of 89.8% (±19.0) (Table 1). 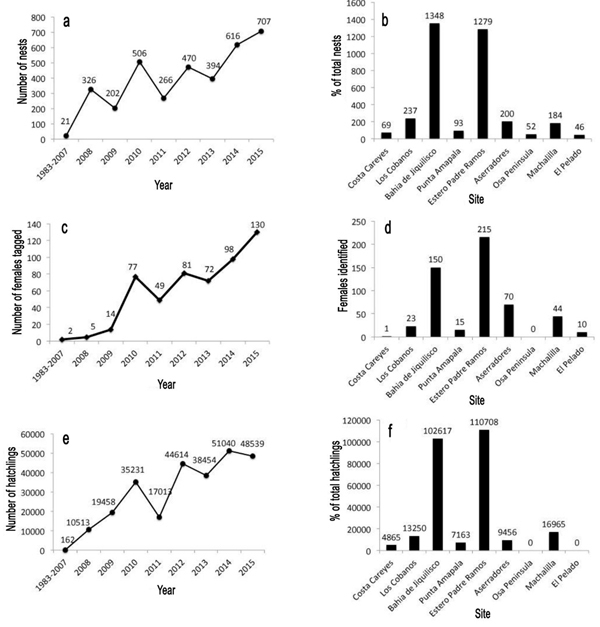 The average annual nest protection rate was above 90% at Estero Padre Ramos (NI; 94.0 ± 4.4%), Costa Careyes (MX; 98.7 ± 4.1%), Machalilla (EC; 99.7 ± 4.7%) and El Pelado (EC; 100%, only one year of data available), and below 70% at Los Cobanos (ES; 61.2 ± 16.7%) and Aserradores (NI; 66.9 ± 36.6%) (Table 1). A total of 528 individual nesting female hawksbills were observed and tagged at the study sites between 1983 and March 2016 (Table 1), with most females (99.4%) encountered since 2010 (Fig. 2c). Of this total, 215 (40.7%) were tagged in Estero Padre Ramos (NI), 150 (28.4%) in Bahia de Jiquilisco (ES), 70 (13.3%) in Aserradores (NI), 44 (8.3%) in Machalilla (EC), and all other sites representing <5% (Fig. 2d). Conservation efforts at these sites led to the production of an average total of 43,481.2 ± 6,473.4 hatchlings per year and a total of 265,024 hatchlings across all years (Table 1), with 99.9% of those records coming since 2008 (Fig. 2e). The majority of hatchlings were produced at Estero Padre Ramos (42.4%) and Bahía de Jiquilisco (39.1%), with remaining sites accounting for ≤5% of all hatchlings produced (Fig. 2f). The average annual number of hatchlings produced per site was above 12,000 at Estero Padre Ramos (NI: 18,451.3 ± 4,728.0) and Bahía de Jiquilisco (ES; 12,827.1 ± 6,907.2), and below 2,000 at Punta Amapala (ES: 1,790.8 ± 519.4) and Costa Careyes (MX: 486.5 ± 663.3) (Table 1). The average hatching success rate across all sites was 56.7% (±20.0), with average annual hatching success rates lower than 55% experienced at both Costa Careyes (MX; 52.2% ± 23.7) and Bahía de Jiquilisco (ES; 52.5% ± 16.5) and rates higher than 70% experience at only Punta Amapala (ES; 72.3% ± 11.6) (Table 1). The majority of hawksbill nests (80.6%), hatchlings (75.1%) and females (82.4%) were recorded at sites located in mangrove estuaries compared to sites located along the open coast. Overall by region, Central America hosted the overwhelming majority of hawksbill nesting (91.9%), followed by South America (6.2%) and North America (1.9%). We found differences in the peak nesting months for hawksbills in the different regions, with a peak in June and July for Central America (slightly elevated values in the latter month), in August for North America, and in January and February for South America (Fig. 3). The average CCL (84.6 ± 7.3 cm), clutch size (159.1 ± 36.9 eggs), clutch frequency (2.0 ± 1.1 clutches), internesting interval (20.1 ± 9.3 days) and remigration interval (2.2 ± 0.7 years) for hawksbills varied among sites (Table 2). (n = 52), Central (n = 2804) and South America (n = 204). provided in right column for each variable. Dash indicates no data available. Prior to 2008, encountering nesting hawksbills in the eastern Pacific was rare and strictly opportunistic, with no programs designed specifically to monitor and conserve the species. This contributed to major data deficiencies in the region and few directed conservation interventions. Since that time, we have established ongoing efforts aimed at monitoring nesting hawksbills at eight of the nine rookeries included in this study. It is important to recognize that the apparent increase in the number of hawksbill nests and nesting females highlighted in this study (Figs. 2a, 2c) are the result of increased monitoring efforts targeting the species, and hence increased documentation. Our findings should not be interpreted as a recovery trend. Hawksbills in the eastern Pacific are recognized as one of the world's most imperiled and least resilient Regional Management Units (RMU) for all marine turtle species (Wallace et al, 2011; Fuentes et al, 2013). Our findings further confirm the status of this RMU, with only 528 reproductive females documented to date across the region. Despite these findings, considering that the species was only recently considered functionally extirpated in the region, there is now optimism regarding potential recovery. Ongoing monitoring at the known nesting sites will undoubtedly lead to the documentation of additional nesting females. However, with the exception of Los Cobanos (ES) and to a lesser extent Aserradores (NI), the currently monitored nesting sites in Central America (which combined host 85% of the known annual hawksbill nesting in the region), as well as Machalilla (EC) in South America, are quickly approaching tag saturation of non-neophyte females. Annual nesting at Costa Careyes (MX) in North America, Osa Peninsula (CR) in Central America and El Pelado (EC) in South America is relatively limited, thus encountering significant numbers of additional females is not likely. We estimate a maximum of 100150 additional females have yet to be tagged across all of our study sites. Thus even with these additions, the total number of nesting females would remain <700 individuals across the region. It is possible that additional rookeries, and hence females, will be identified, but efforts have been carried out along much of the eastern Pacific coastline and reports of nesting remain minimal (Gaos et al., unpubl. data). Ongoing conservation actions continue to produce hatchling cohorts, a portion of which will presumably mature into adults. If coupled with decreases in the mortality of adults and juveniles (as a result of conservation actions), we would expect the number of nesting females to increase with time. However, given that hawksbills are estimated to require 17+ years to reach sexual maturity (Boulon, 1994; Chaloupka & Musick, 1997; Crouse, 1999; Snover et al., 2013) and that the bulk of hawksbill conservation in the eastern Pacific was only initiated in 2008, it may be decades before we see an appreciable increase in the number of nesting females. Hawksbills in the eastern Pacific nest on average every 2.2 ± 0.7 years, but in contrast to most other rookeries where nesting in consecutive years is rare or non-existent (e.g., Mortimer & Bresson, 1999; Richardson et al., 2006; Moncada et al., 2010; Prince & Chaloupka, 2012), annual nesting appears relatively common (10.7% of remigrants; n = 22) in both the Central and South American regions of the eastern Pacific (Fig. 4; data unavailable for North America). Oviposition is an energy-demanding process and female sea turtles often skip reproductive years if they do not have sufficient fat reserves, instead remaining in foraging areas to continue to feed and accumulate the energy required (see refs in Santos et al., 2010). Our remigration intervals were pooled from three of our study sites located in the Central (n = 2) and South (n = 1) American regions (Table 2), from which a total of 18 post-nesting hawksbills have been tracked via satellite telemetry, the majority (n = 15; 83.3%) to foraging grounds located in mangrove estuaries (Gaos et al., 2012a, 2012b; Gaos & Seminoff, unpubl. data). Mangrove estuaries are one of the most resource-rich habitats along the eastern Pacific coastline (Dewalt et al., 1996; Gaos et al., 2012b) and an abundance of high-quality prey (e.g., invertebrates) in these habitats may provide sufficient energy resources to enable nesting during consecutive years at these study sties. Additionally, adult hawksbills in the eastern Pacific undertake relatively short post-nesting migrations between nesting and foraging grounds (maximum = 283.1 km) or are non-migratory altogether (Gaos et al., 2012a, 2012b), a behavior that would further facilitate nesting during consecutive seasons. In general, hatching success for hawksbills in the eastern Pacific is on par with conspecifics in other regions (Bjorndal et al., 1985; Marcovaldi et al., 1999; Richardson et al., 1999; Hitchens et al., 2004; Ditmer & Stapleton, 2012). However, with the human consumption of eggs consistently approaching 100% prior to the start of conservation efforts (except for Ecuador) (Vásquez et al., 2008; Altamirano, 2014), and this level of exploitation being maintained for decades along Pacific Latin America (Cliffton et al., 1982; Cornelius, 1982), it is reasonable to assume that little hatchling recruitment occurred during that time. Excessive egg harvest might have set up a 'population time-bomb' (Mortimer, 1999) for hawksbills in which population numbers could suddenly collapse due to lack of immature turtles that would serve to replace older adults as they die (Seminoff & Shanker, 2008). Our reports of nesting females demonstrate that we likely have not reached that point, at least at the three primary rookeries in Central America (i.e., Bahia de Jiquilisco, ES; Estero Padre Ramos, NI; Aserradores, NI). In contrast, it is possible that the extremely low nesting numbers in North and South America (and smaller rookeries in Central America) may be direct evidence that such a collapse is already occurring. However, the low nesting in North and South America could also be due to these rookeries being located at the extremes of hawksbill distribution in the region (Alfaro-Shiqueto et al., 2010; Quiñones et al., 2011). Regardless, conservation efforts since 2008 have led to the release of more than 265,000 hawksbill hatchlings across the region (Table 1). If even a small proportion of these hatchlings represent juveniles 'in the pipeline' that will eventually reach maturity (Seminoff & Shanker, 2008), they should improve the conservation outlook for hawksbills in the eastern Pacific. Ensuring the protection of hawksbills at their foraging grounds will be fundamental to recovery efforts as sea turtles spend the majority of their lives in these habitats and efforts focused solely on nesting beaches can be insufficient (e.g., Benson et al., 2015). A combined total of 80.6% of the hawksbill nesting documented to date in the eastern Pacific has occurred in the mangrove estuaries at Bahia de Jiquilisco (ES), Estero Padre Ramos (NI) and Aserradores (NI), highlighting the relative importance of these habitats for hawksbills in the region. Without question, major degradation to these sites, which are under increased anthropogenic pressures (Gaos et al., 2012b; Altamirano, 2014, Liles et al., 2015b), would represent a major hindrance to hawksbill recovery. Of primary concern is the conversion of mangrove habitat to shrimp aquaculture ponds. 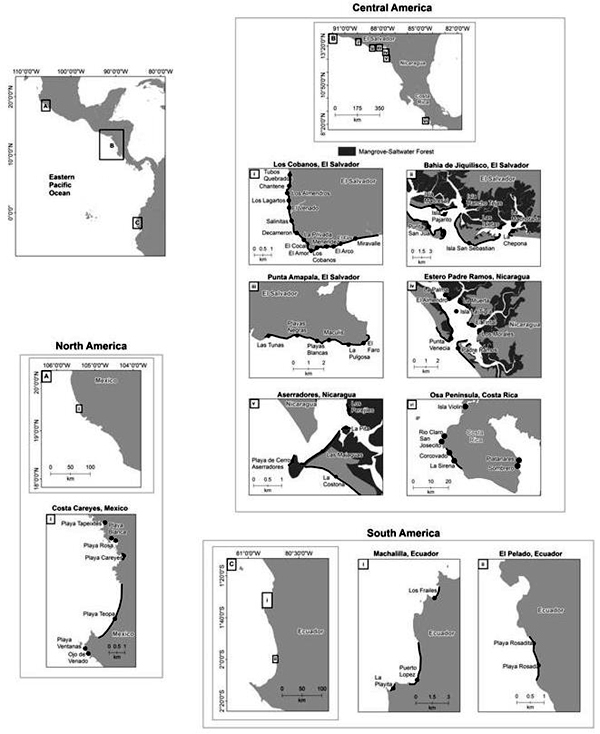 While such conversions remain relatively limited at our study sites, similar habitats in the region (e.g., southern Gulf of Fonseca) have been severely impacted by these practices (Dewalt et al., 1996, Blazquez & Navarrete, 1996). Unfortunately, despite protected area status at two of these three nesting sites, as well as mangrove protection legislation in both countries, many of these protected areas are only considered as such by law (i.e., paper reserves sensu Valdez, 2008), while in actuality receiving limited enforcement by government authorities and continuing to experience high rates of biodiversity and habitat loss (Liles et al., 2016). Considering the critical nature of the hawksbill rookeries in these areas, their urgent, permanent and authentic protection is vital. Climate change is also of marked concern to hatching success in these habitats as the nesting beaches throughout the estuaries are of low relief, with minimal elevation change, and eggs are laid <1 m from the water table (Liles et al., 2015b), making them particularly susceptible to inundation and mortality (Fuentes et al., 2013). For the first time at any of the three mangrove estuary sites, in August of 2015 spring tides led to the lethal flooding of more than 30 nests positioned on the highest sand berms in Bahia de Jiquilisco (ES). Anthropogenic-induced global warming is predicted to lead to more extreme climactic events and an overall increase in average global ocean levels (IPCC, 2013), which may increase nest inundation and mortality events at these sites. Aligning diverse stakeholder interests to hawksbill conservation needs is a challenging task (Fabbri, 1998; Olsen et al., 1997). Landowners and development are often viewed as threats to conservation (Jacobson et al., 2010), yet antagonistic views of these stakeholders can be unwarranted. The primary hawksbill nesting habitat in Aserradores (NI) is on the private property of a single land-trust. While several years ago the trust built a small marina within the estuary, they have committed to protecting other parts of the estuary, including the primary hawksbill nesting habitats. Additionally, the trust actively participates in and contributes to hawksbill conservation, which is further facilitated by only having to deal with a single entity rather than numerous landowners who often have conflicting interests. Notwithstanding this perspective, conflicts between several local stakeholders and the marina over resource rights do exist and threaten to impact the effectiveness of conservation efforts. In a different development scenario, but one with similar results, the coastline of Costa Careyes (MX) consists primarily of exclusive resorts and high-end homes, limiting beach access to the general public. While Costa Careyes does not have any official protective status, the restricted access provides a certain degree of pseudo-protection and only three hawksbills nests have been recorded as lost, all due to the predation by ants. However, monitoring at this site is limited and thus it is likely that some nests are poached and/or go undocumented. Development obviously does present risks to habitat as well. Most of the Machalilla nesting complex (EC) is part of a national park and the primary nesting beach (La Playita) is well protected. However, the large coastal community of Puerto López is excluded from the park and the waters directly in front of the town are important foraging areas for adult and juvenile hawksbills. In 2014 there was an initiative to build a solid cement pier on the southern end of the beach, with construction planned directly on top of parts of the primary foraging habitat. While the effort was initially thwarted thanks to the actions of a local conservation organization, plans to build the pier have recently been revived (Ministry of the Environment report MAE-SGMC-2015-0582, 22 June 2015). Hawksbills also occasionally nest on the beach of Puerto López, where the government is currently building a cement boardwalk along most of the beach and the impacts the boardwalk may have on hawksbill nesting remain unknown. It is important to point out that recent genetic research has identified Machalilla as a distinct management unit (MU) from MUs located in Central America (n = 3; Gaos et al., 2016). Coupled with apparent differences in size (CCL) and nesting season (Table 2 and Fig. 3, respectively), increased efforts to ensure this already depleted rookery persists may be warranted. Prior to 2015 Machalilla was the only known nesting site along Pacific South America. However, the pilot monitoring program initiated in El Pelado (EC) in 2015 led to the documentation of a total of 46 nests and 10 females in a single season of monitoring. While this fledgling project was somewhat rudimentary in terms of beach coverage and data collection, the initial findings bode well for the conservation outlook of hawksbills along Pacific Ecuador. Efforts are being made to increase coverage of the nesting beach in an effort to observe additional nesting females, evaluate hatching success, collect genetic samples and gather additional information. Plans to develop a condominium complex directly in front of the primary hawksbill nesting beach of Playa Rosada in El Pelado threaten to negatively impact nesting females/hatchlings and should be closely scrutinized. The relatively low representation of Aserradores (NI) in terms of overall number of nests, hatchlings and females (Figs. 2b, 2d, 2f) across years masks its relative importance. Monitoring of hawksbills was only initiated in 2014 and during the subsequent two years (i.e., 2014-2015), 200 nests and 70 nesting females recorded at the site during that time. Indeed, with an average of 100 ± 24.0 nests deposited annually, Aserradores is the third largest known rookery in the region (Table 1). Due to the relative infancy of the program, illegal collection (i.e., poaching) of nests remains a challenge (Table 1), as is the case with many of the programs during their initial years, and it is expected that conservation results will improve as interpersonal relationships are built with advancement of the program (e.g., Hawksbill Cup competition, Liles et al., 2016). Similar to Aserradores, the regional importance of Los Cobanos (ES) in the overall hawksbill nesting totals is also somewhat misleading, but for quite a different set of circumstances. After a successful inaugural 2008 season during which monitoring resulted in the recording of 79 nests, the program only functioned for one out of the subsequent five years. The program was re-initiated in 2014 and has continued to function since that time. Nonetheless, the presence of local gangs (referred to in El Salvador as "Maras") on the beaches that are often involved in the illegal collection and sale of turtle eggs, discourages program collaborators from patrolling certain beaches and/or during certain times (Liles et al., 2011). This reduces our ability to collect information on the species and protect a greater percentage of nests (poaching at Los Cobanos is approximately 40% of total nests annually). Despite being the fourth largest known hawksbill rookery in the eastern Pacific in terms of average annual number of nests (Table 1), there are no immediate solutions to this issue in sight. The beaches identified along the Osa Peninsula (CR) collectively represent the only site not currently being monitored for hawksbill nesting. This is due to the sparse and relatively low levels of nesting across what constitutes a relatively large geographic area (approximately 25 km, Table 1). Coupled with most of the beaches being extremely remote and difficult to access, these realities render ongoing monitoring efforts unfeasible. Indeed, identifying and protecting hawksbill nesting grounds throughout the eastern Pacific remains challenging due to the disparate, low-density, cryptic nesting demonstrated by the species (Vásquez & Liles, 2008; Gaos et al., 2010; Liles et al., 2011, 2015a) as these nesting characteristics necessitate logistical, temporal and/or financial investments that often are unattainable by researchers. Regardless, efforts to identify nesting habitats can be facilitated by focusing acute, rapid assessments during the peak nesting seasons (Fig. 3) (SWOT, 2011). Sites of primary importance for such assessments in North America (i.e., Mexico) include the 'Islas Tres Marias', an island chain off the coast of the Mexican state of Nayarit that has long been rumored to host important numbers of nesting hawksbills (Sweifel, 1960; Woodes, 1711 in Saenz-Arroyo et al., 2006), but which has yet to be properly investigated (Gaos & Yañez, 2012), as well as much of the rocky coastline along the Mexican state of Michoacan, which is interspersed with numerous small sandy coves. In Central America, the coastline along northwest Costa Rica (particularly in Santa Rosa National Park), as well as the beaches of Coiba Island, Las Perlas Archipelago and the Darien Gap in Panama, are sites that are difficult to access and remain poorly researched. In South America much of the coast of Colombia remains under investigated, particularly in the northern Choco region. Long-term, consistent data collection at the rookeries highlighted in this study is necessary to evaluate population trends over time. Additionally, rigorous data on survival and growth rates are needed for the development of accurate population models (Chaloupka & Limpus, 2005; Eguchi et al., 2010) and long-term in-water monitoring programs recently began at several key hawksbill foraging grounds in an effort to generate the necessary information. Further, these in-water monitoring programs seek to evaluate whether increased numbers of young life-stage hawksbills are recruiting to foraging grounds as a result of previous and ongoing nest/hatchling conservation efforts at rookeries. In this study we provide the most current and robust nesting dataset for hawksbill turtles in the eastern Pacific. Only a few years ago records of nesting by the species in the region were virtually non-existent. The movement to discover, learn about and conserve hawksbills in this ocean region was precipitous and has advanced rapidly since commencement. This has led to increased documentation of hawksbills, demonstrating ongoing persistence of the taxa in the region and providing hope for recovery. Nonetheless, as we've demonstrated here, the species remains in a highly precarious state (Table 1) and remains largely conservation dependent (Scott et al., 2005). Ongoing efforts to protect hawksbills at our study sites are essential to recovery of the population. We thank the National Fish and Wildlife Foundation, U.S. National Fish and Wildlife Foundation, U.S. National Oceanic and Atmospheric Administration, U.S. Agency for International Development, International Seafood Sustainability Institute, SeeTurtles.org, Darwin Initiative, Seaworld Busch Gardens Conservation Fund, The William H. Donner Foundation, Inc., Marina del Sol, Asociación Mangle, Ayuda en Acción, CODEPA, FUNDARRECIFE, FUNZEL, The Rufford Foundation, Puerto Barillas, Vivazul, Plant-A-Fish, ? !Careyes Foundation, Bodega Williams & Humbert, Conservation International-Ecuador, Machalilla National Park, The Ocean Foundation and the Hawksbill Committee of Estero Padre Ramos for logistical/ financial support. We are grateful to national environmental authorities in Mexico (CONANP), El Salvador (MARN), Nicaragua (MARENA), Costa Rica (SINAC-ACOSA) and Ecuador (MAE) for permits. We are indebted to the community members and careyeros of the study sites for their support. In particular we would like to thank the following individuals: Perla Torres, Luís Manzanares, Neftalí Sanchez, Melissa Valle, Wilfredo López, Celina Dueñas, Luis Mera, Ricardo Gonzales, Alexis López, Alan Baez, Katty Rendn, Paulina López, Michelle Pico and Earl Possardt.